In posts past, we’ve had a wide variety of topics, although in one way or another they all have the common denominator of being centered around the idea of woodworking. We’ve looked at little-known facts about woodworking, the ancient history of woodworking, and we’ve also addressed why you should take a woodworking class, inspiration for beginners. We’ve also explored our range of woodworking classes in NJ and NYC (Hoboken, to be exact). You can make anything from furniture to unique picture frames to a charming, rustic cutting board. Whichever class you end up taking, we’ll equip you with the requisite knowledge to use the woodworking equipment we have in our studio. 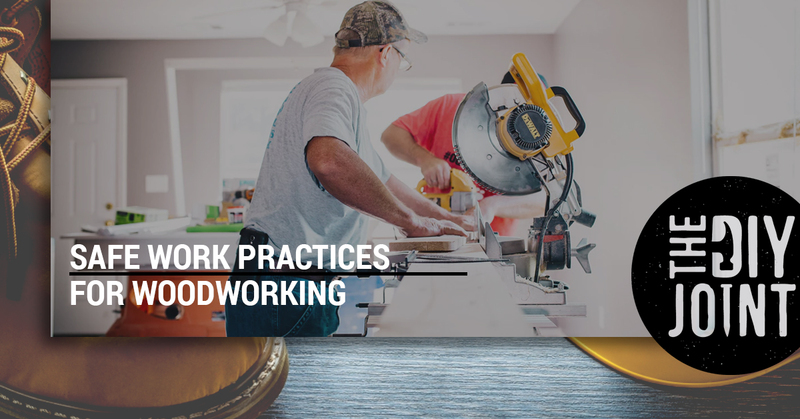 With that in mind, we thought we might depart from our typical topic range, in favor of some practical safety information in reference to safe work practices for woodworking. Can you use a Bosch 12: Dual Bevel Saw? A drill press? A band saw? How about an oscillating spindle sander? Don’t worry, nobody knows how to use these tools innately. Everyone has learned to use them, so we aren’t trying to intimidate you so much as inspire you to unlock a new talent. And no, we aren’t under the illusion that reading this blog post will magically give you the skills you need to use every tool at the Joint. Rather, these are some helpful safety tips that can be applied in any studio and at any time. Come to our woodworking classes with these tips as a foundation, and you’ll be set up for success. Wear protective (closed-toed) footwear while working in the Joint. Wear a protective mask to keep out sawdust. At the DIY Joint, you’ll need to provide these masks yourself. If the machinery you are using is noisy, you should have hearing protection on hand. Wearing safety glasses is must anytime you are working in the shop as well. Use gloves to protect your hands from getting splinters when handling wood. Do not wear them while you are using equipment with rotating blades or other woodworking tools that might cause the gloves to catch. Likewise, don’t wear baggy clothing that might have a chance of catching while you are using a saw blade or the like. Ensure that all machinery used is properly grounded before use. You’ll want to also make sure that all wrenches used for adjusting are removed from the machine in question before pressing that “on” button. Before routing, planing, or cutting, make sure to inspect all stock you plan on using for nails or other rogue, unwanted material. Don’t alter your state of mind before working with wood. Substances which may intoxicate you, combined with a woodshop, result in a potentially dangerous blend. Even if you are working on your own, one beer in the garage can quickly become three or four, so it’s a safe bet to completely avoid a potential problem. Fingers are valuable. Let’s not forget this. Don’t used compressed air in an attempt to remove sawdust or turnings from machines or clothing. Always turn your machine off and wait for it to come to a complete stop before attempting to free a stalled blade. Horseplay can lead to injuries, so keep the roughhousing out of the shop! Contact The DIY Joint Today! Here at the Joint in Hoboken, NJ, we have a passion for providing a space and opportunity for folks looking to discover something new about themselves. Our favorite part of holding NYC woodworking classes for beginners, intermediates, and advanced woodworkers is the fact that we can tangibly see people get excited about a new talent as they unearth something that was slumbering deep within them. Creating something with our hands is something humans have been doing for generations, and only recently have we lost touch with that integral part of our humanity. If you are interested in our NJ woodworking classes, view our class schedule today!